One of the most useful tools for quick test setup is only about the size of your thumb. 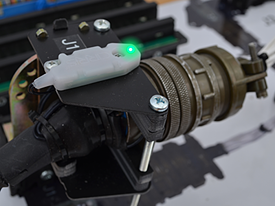 Cirris Smart-Lights™ can store information for fixturing cables, show error location, and save you time and money. Fixturing cables can become a hassle. Their job is to connect the device-under-test (DUT) to the tester. Each fixturing cable has a connector that attaches to the tester and one that attaches to the DUT. When it comes time to test a new type of DUT, the fixturing cables must be changed out for new ones with different connectors for the new DUT. If you are using an existing test program, you must make sure the fixturing cables are attached in the same order as they were when the test program was created. This is the only way for the tester to detect each test point on the cable accurately. Remembering where each fixturing cable was attached during the last test run can be difficult. That is where Smart-Lights come in. Smart-Lights store the information for each fixturing cable, making it possible to attach them in any order. Rather than spend time labeling cables and recording each cable’s position, you can attach the fixturing cables, attach the DUT, and start a test.